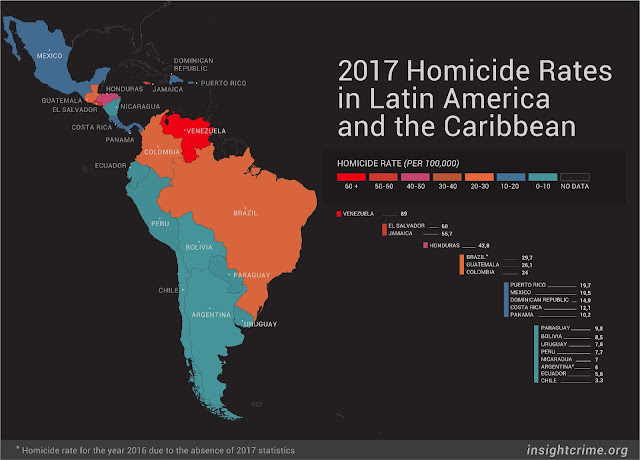 Just 4 countries in the region — Brazil, Venezuela, Mexico and Colombia — with annual murders in 2017 of above 133,000, account for almost a quarter of all the murders on Earth. Of the 20 countries across the world with the highest murder rates, 17 are in Latin America while 43 of the top 50 cities are in the region. In 2017, a record 63,808 people were murdered in Brazil — which has a population of 209m — Mexico also set a record at 31,174. Venezuela had an estimated 26,616 deaths (excluding state murders) while 11,781 murders were recorded in Colombia. The 2016 total tally for murders in China, according to UN data was 8,634; 5,351 in the European Union, and 17,250 in the United States — the population of China is 1.39bn while the EU population is 513m and the US is 326m. According to The Wall Street Journal, between 2000 and 2017, roughly 2.5m people were murdered in Latin America and the Caribbean, as if Chicago were wiped out. That compares with about 900,000 killed in the armed conflicts of Syria, Iraq and Afghanistan combined, according to UN figures and estimates by groups like Iraq Body Count. During that same period, all the world’s terrorist attacks killed 243,000 people, according to the University of Maryland’s Global Terrorism Database. The Journal adds that "while murder rates are falling in most of the world, in Latin America the number of murders has grown about 3.7% a year since 2000, three times faster than the population, according to a 2018 report from the Igarapé Institute, a nonpartisan think tank focused on Latin America. The region’s murder rate, at about 24 per 100,000 right now, will hit 35 per 100,000 by 2030 if the trend isn’t reversed." The Economist notes that Latin America is also the most urbanised part of the developing world, and that is not a coincidence. Its urban population grew in the second half of the 20th century much faster than those of other regions. By 2000 over three-quarters of the population lived in towns and cities — roughly twice the proportion in Asia and Africa. "That move from the countryside concentrated risk factors for lethal violence — inequality, unemployed young men, dislocated families, poor government services, easily available firearms — even as it also brought together the factors needed for economic growth. As other developing economies catch up with Latin America’s level of urbanisation, understanding the process’s links to criminality, and which forms of policing best sever them, is of international concern." The newspaper adds that some countries in the south of the region have urbanised as fast as those in its north, "but murder rates in the south remain comparable to that of the United States. The illicit drugs trade in the northern part of the region undoubtedly makes a big difference. And some countries where murder rose have since seen it decline." In 2017 good news in Colombia resulted from years of enlightened reforms with the murder rate at 24 per 100,000 — the lowest for 42 years. In addition to closing down the drug cartels operating in places like Medellín, and besides inevitable drug wars, research found that many deaths resulted from drunken brawls. US academic researchers reported in a paper last year that in El Salvador and Honduras, there was "overwhelming evidence that the nature of emigration from these two countries in recent years is fundamentally distinct from the standard economic migrant narrative that has been used to describe those arriving at the US border from Mexico and Central America over the past thirty years. While the emigration decision is never based on a single factor, the role of crime and violence appears to be decisive for those individuals both the Obama and Trump administrations have been trying to deter in recent years." The US murder rate at 5.3 per 100,000 residents in 2016 compared to 1.7 for Canada; 1.2 for the UK and Germany; 0.7 for Italy; 0.8 for Ireland, and 0.96 for the European Union of 28 countries. The Russian Federation was an outlier in Europe at 10.8. In Asia in 2016, China had a murder rate of 0.6 per 100,000 residents; India 3.8; Japan: 0.3; South Korea: 0.7; Indonesia, the world’s most populous Muslim nation was at 0.5 and Malaysia 2.1 (2013). The outlier was the Philippines, a former Spanish colony in the period 1571-1898, followed then by the US until 1946. Its murder rate is about 11 per 100,000. Despite its reputation, the Middle East and North Africa have a low murder rate. Algeria, Egypt and Morocco had murder rates of between 1.2 and 2.5 per 100,000 residents in 2016 while the Lebanon which had a vicious civil war in 1975-1991, has a murder rate of about 4 per 100,000. Criminal violence does not include armed conflicts in Syria and Yemen. In Africa, South Africa’s murder rate of 34 per 100,000 is above Brazil and Mexico while Nigeria's rate was 9.8 in 2015. In the rest of Africa, the data is generally positive. Ethiopia’s rate (2015) was 7.6, and rates in both Kenya and Angola were about 4.9 — compared with the US rate of 5.3. Malawi was at 1.8. Rwanda, which endured a genocide in the early 1990s is now at 2.5. Including state violence, Venezuela's murder rate was 89 per 100,000 in 2017. Chile's rate in 2017 was 3.3. A UN report in 2018 noted that a total of 87,000 women were intentionally killed in 2017. More than half of them (58 %) — 50,000 — were killed by intimate partners or family members, meaning that 137 women across the world are killed by a member of their own family every day. More than a third (30,000) of the women intentionally killed in 2017 were killed by their current or former intimate partner — "someone they would normally expect to trust."